Of the 57 starvation deaths investigated by the Right to Food campaign since 2015, at least 19 were directly linked with Aadhaar. Santoshi Kumari died of hunger in Jharkhand on September 28, 2017. Exactly one year ago, 11-year-old Santoshi Kumari died in Jharkhand’s Simdega district, while asking her mother for rice. The girl, a Dalit, had barely eaten for eight days, because her destitute family had not received their quota of subsidised foodgrains for six months. This was not the first starvation death caused by the failure of India’s public distribution system. Under the National Food Security Act passed in 2013, the government must provide five kilos of subsidised foodgrains to 75% of India’s rural population. But the identification of beneficiaries under the new law has been imperfect, with many poor people not making it to the revised PDS lists. The child’s death, however, highlighted another silent disruption underway: even those who were listed as beneficiaries were being denied rations because of the government’s decision to link the public distribution system to Aadhaar. Santoshi’s family was struck off the PDS list as “ghosts” or non-existent beneficiaries because they had failed to furnish their 12-digit biometrics-based identification numbers. Santoshi’s death caused a national furore, but little has changed in the year since she died. At least 37 starvation deaths have been recorded in the past 12 months. According to the Right to Food campaign, which has investigated the deaths, 13 are related to Aadhaar. This is a sobering statistic in light of the Supreme Court’s verdict this week. On Tuesday, four judges in a majority judgement upheld the constitutional validity of Aadhaar, allowing the government to make it mandatory for citizens drawing benefits from government welfare schemes. The Right to Food campaign has released a list of 57 starvation deaths in nine Indian states from 2015 to now. Activists who are part of the campaign have investigated these deaths, some of which were first reported in the media. The data has been compiled by economist Reetika Khera who works with Right to Food campaign and activist Siraj Dutta. 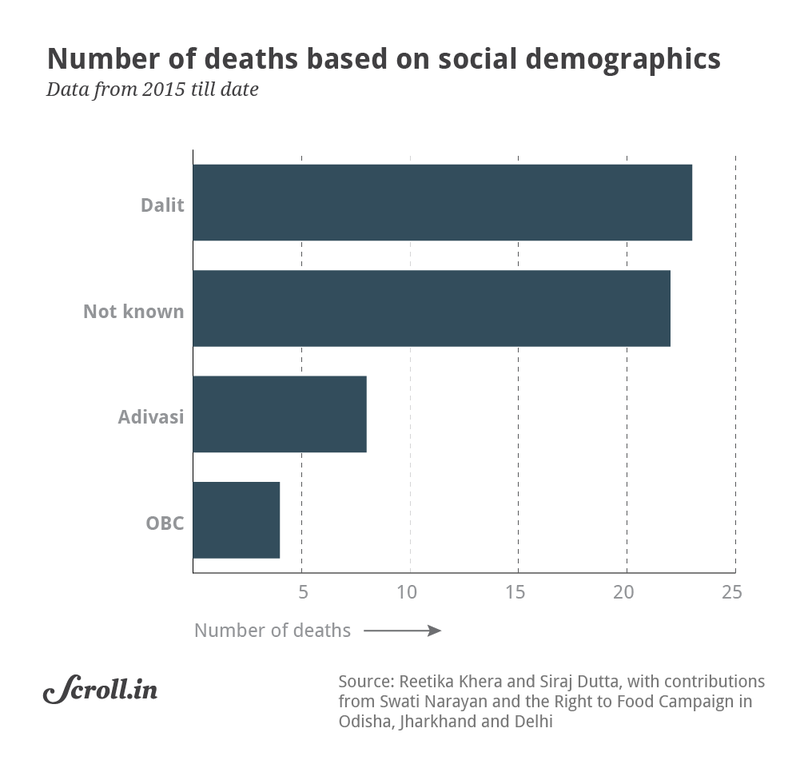 Geographically, the majority of deaths on the list are concentrated in Uttar Pradesh and Jharkhand, followed by Odisha. Not all of the deaths are linked with Aadhaar. But Aadhaar dominates among the causes of death. At least 19 deaths were directly linked to Aadhaar: the deceased were denied food rations from government-run ration shops either because their ration cards were not linked or “seeded” with Aadhaar, or because of a failure of Aadhaar-based biometric authentication. The latter involves verifying a beneficiary’s identity by scanning their fingerprints and matching them with the biometric information stored in the Aadhaar database. When fingerprints fade, or connectivity fails, such authentication is not successful. In October 2017, for instance, a 60-year-old Adivasi man, Ruplal Marandi, died in Jharkhand’s Deoghar district after his family was denied rations for two months. The reason? Biometric authentication failed and Marandi was unable to prove his identity. 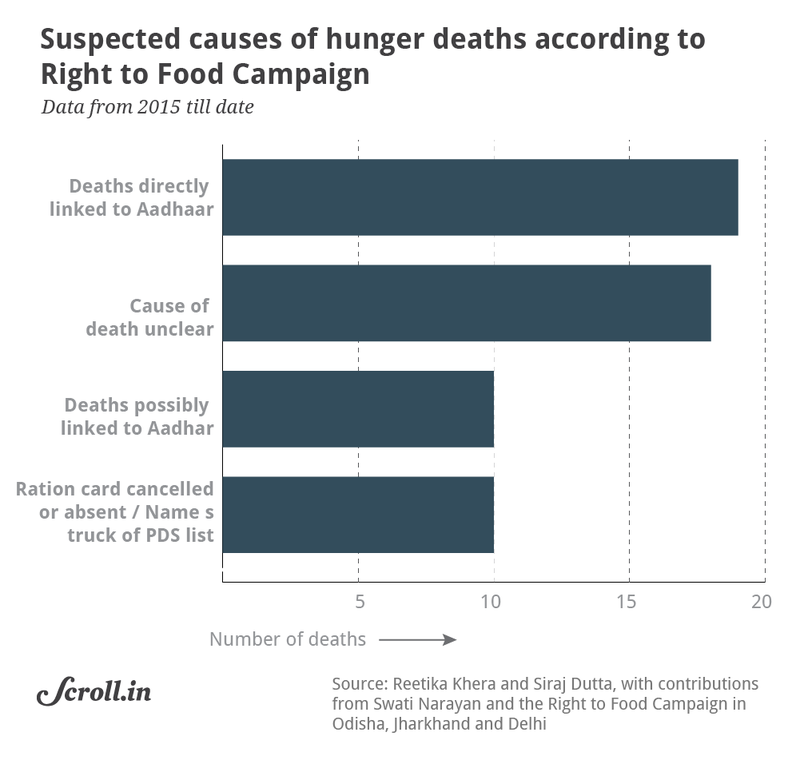 Right to Food activists suspect the role of Aadhaar in ten other deaths where eligible people were denied rations for unclear reasons for several months before they died. For instance, a month after Santoshi Kumari’s death, a 45-year-old Adivasi woman named Lalita Kunwar died in Jharkhand’s Garhwa district. Her family had been denied rations for six months before her death. The death count has been steadily rising. The number of deaths reported in the last 12 months is nearly double the deaths reported in the two-and-a-half years between 2015 and mid-2017. 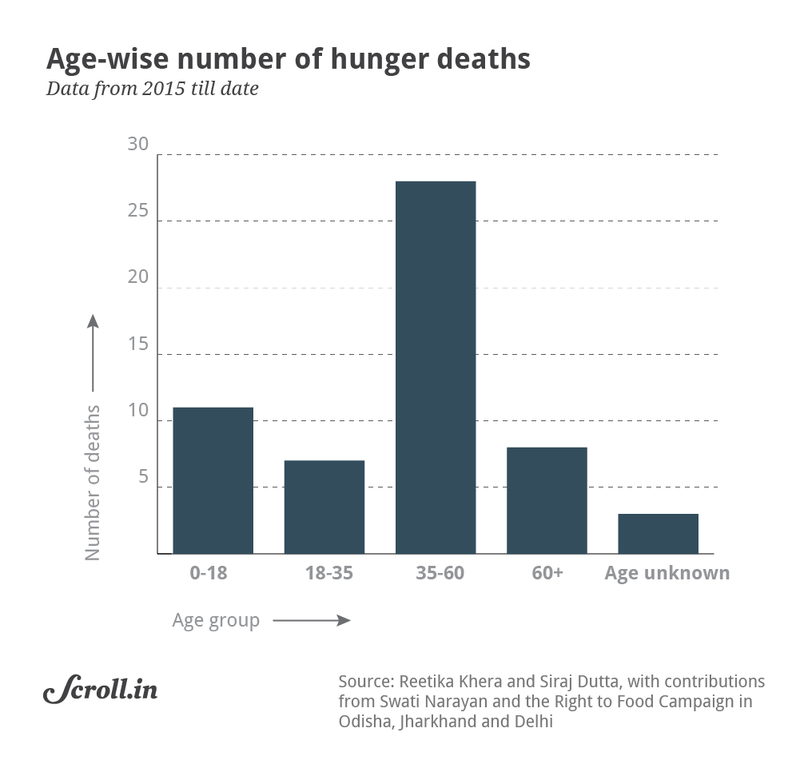 One reason for this could be an increased awareness about hunger deaths in the media, which is prompting journalists to report on them more actively. 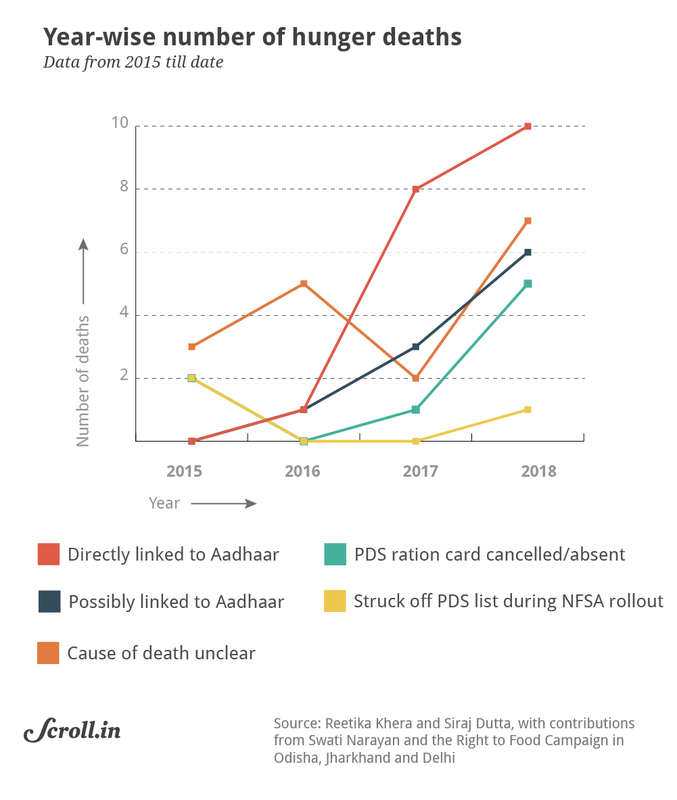 However, even after factoring in better media reportage, it is evident that the years 2017 and 2018 saw a shockingly high number of deaths directly linked to the imposition of Aadhaar in the public distribution system. According to Khera, 2017 and 2018 was when states like Uttar Pradesh and Jharkhand made Aadhaar mandatory for food rations. In cases not linked to Aadhaar, the whims of an arbitrary public distribution system proved to be fatal. The transition under the National Food Security Act, in particular, caused upheaval. On August 22, for instance, 59-year-old Mungre Chhura died of hunger in Odisha’s Bolangir district because her name was inexplicably struck off the PDS list after the National Food Security Act came into force. As an impoverished Dalit woman, Chhura should have been entitled to 35 kg of rice per month on her Antyodaya or “priority household” ration card, but received none. The National Food Security Act came into force in 2013 and was gradually rolled out over the next few years as states made fresh lists of eligible citizens. The new Act was meant to widen India’s food security net, while weeding out those who were ineligible for food rations. But as fresh lists were made based on the 2011 Socio-Economic Caste Census, many eligible families were left out. Many citizens found their names missing because they were born or married into eligible families after the 2011 Socio-Economic Caste Census was conducted. While earlier food allotments were made per family, now they were made per individual. 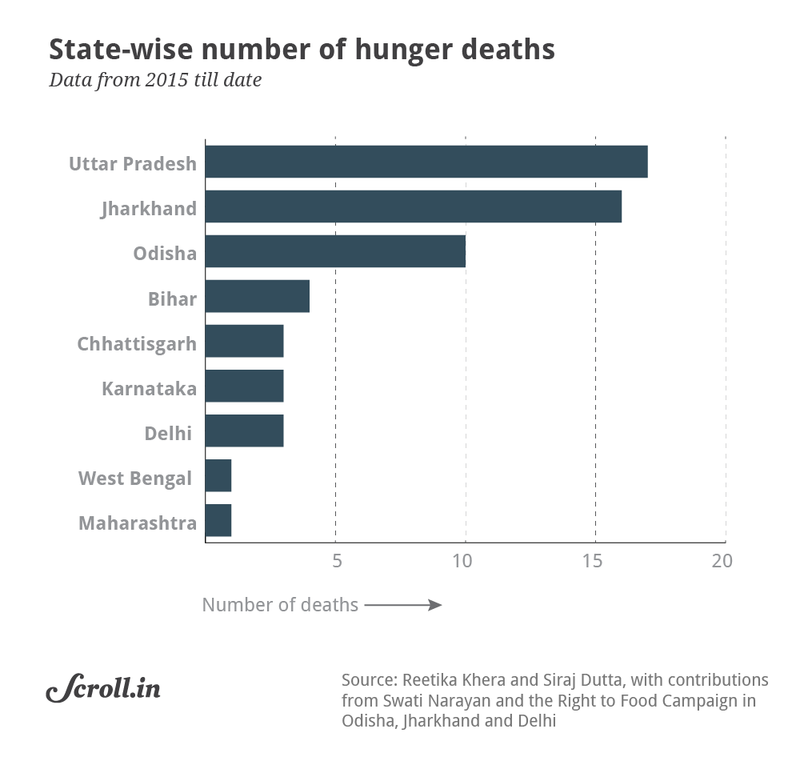 Unsurprisingly, the Right to Food Campaign’s list reveals how disproportionately starvation affects vulnerable and marginalised populations in rural India. Dalits make up 23 of the 57 recorded hunger deaths, while Adivasis and Other Backward Classes make up 8 and 4 deaths respectively. Santoshi Kumari was not the only child who features in the list. Eleven of the deaths were of minors – some children as young as two months old – while eight were senior citizens above the age of 60. After Santoshi Kumari’s widely-reported death last year, the Centre instructed states not to deny rations to anyone without an Aadhaar linkage or biometric authentication. The Supreme Court’s majority judgement, in fact, takes note of such government orders and expresses faith in measures taken to avoid exclusion of vulnerable families. But the past year has shown such orders have remained mere lip service, say Right to Food activists. 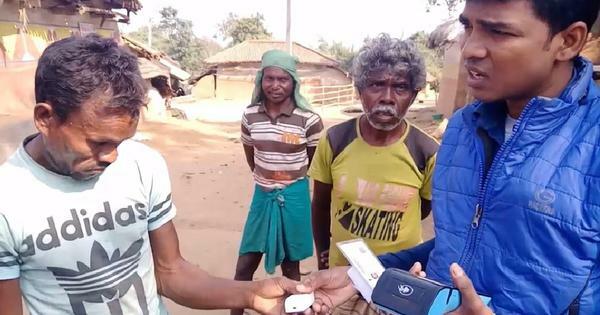 District officials and ration shops in several parts of Jharkhand, Uttar Pradesh and other states continued to demand Aadhaar biometric authentication for availing of social welfare schemes, even if it meant denying food to the poorest, vulnerable people eligible for the scheme. Two-year-old Munni and five-year-old Govinda from Bihar’s Buxar district paid with their lives for such defiant Aadhaar imposition. The children were from a family of Musahars, one of the lowest castes among Bihar’s Dalits. The family was unable to get work under the National Rural Employment Guarantee Scheme, and even though they had a PDS ration card, they had not been able to get an Aadhaar card made. For eight months since the beginning of 2018, the family was denied rations. On September 1, Munni and Govinda died of hunger.